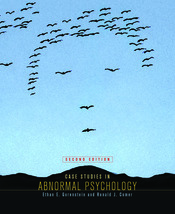 Fully updated for DSM-5, this exciting revision complements the abnormal psychology course by providing 17 case histories based on the authors' clinical experiences. Each case study goes beyond DSM-5 diagnosis to describe the individual's history and symptoms, a theoretical discussion of treatment, a specific treatment plan, the actual treatment conducted, and assessment questions for students. The casebook also provides three "You Decide" cases -- written without diagnosis or treatment, so students can identify disorders and suggest appropriate therapies. This new edition adds assessment questions to the end of each case and also features three brand new cases: hoarding, somatic symptom disorder, and gender dysphoria.